Photo contributed by Henry Hartman/Creative Images Japanese blueberry trees are planted on the sunny side of this bed and form the backdrop to a partially-shaded, landscaped location. They provide a dark evergreen color to any setting year-round. Donated to the Master Gardeners as a young shrub by a local garden club about seven years ago, this Japanese blueberry tree stands today in full stature and form growing outside the gate of Victoria Educational Gardens. A group of Japanese blueberry trees are planted in a row in full sun and complement the narrow landscape. Taken several years ago at a local hospital, this photo shows trees that continue to flourish through time with minimal pruning. As my friend Grace Margaret and I left for one of our day-ventures last fall, she said, "Oh look, my neighbors are planting blueberry trees!" She continued, "It's a lovely tree and will grow quite large." Later that day, as we left a local restaurant, Grace Margaret commented, "Oh, there's another blueberry tree, but this one is being grown like a shrub." My response was "blueberry trees and shrubs? I thought blueberries grew on bushes?" Ah, time to learn more about this special tree that is also a shrub. The Japanese blueberry tree is in the Elaeocarpaceae family and grows in USDA zones 9-11 landscapes. 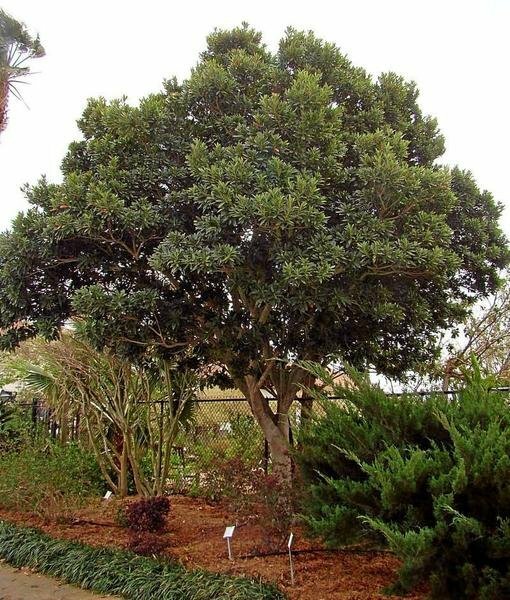 It is classified as an evergreen ornamental tree that likes full sun to partial shade and a well-drained soil. Small white flowers cluster - This time of year the tree has small, fragrant white to greenish white urn-shaped flowers. The flowers grow in clusters and collectively are quite fragrant but they tend to be hidden by the tree's dense foliage. Fruit resembles big blueberries - In addition the tree's fruit is a small blue-black drupe that clusters and at first glance looks like big blueberries that are randomly distributed in the tree. Leaves occasionally turn with age - Its leaves are dark, lustrous green and rather leathery in texture. As the leaves age, they turn yellow-orange to bright red. Looking at the tree, you might only find a couple of red leaves in the dark, green foliage. 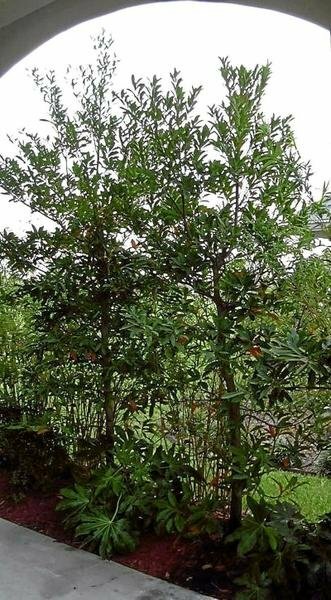 As an evergreen, it does not turn color or shed its leaves. According to a area landscaper, the Japanese blueberry tree is actually a large shrub that began selling in Victoria about 12 years ago. Most consumers preferred them to be tree-shaped, and they are often referred to as the lollipop trees. They are both disease- and drought-resistant and can grow to 40 to 60 feet tall with a 20- to 40-foot spread. Thrives on sun - If you choose a Japanese blueberry tree or shrub, be sure to place it in full sun or partial shade. It thrives on the sun and needs very little pruning. Prefers consistent watering cycle - Avoid over-watering and provide a consistent watering cycle and good soil drainage until it is fully grown. The Gardening Central website (gardeningcentral.org) recommends that the tree be fertilized early in the spring to encourage its growth and development. It also recommends that when the soil is dry 3 inches down from the surface, it is time to water. In both 2010 and 2011, Victoria experienced very harsh winters, and blueberry tree trunks cracked and contracted diseases. Therefore, the supply of Japanese blueberry trees at tree farms was very limited. In 2012, Victoria had a mild winter, and more Japanese blueberry trees became available again. However, according to area nurseries, the popularity of the blueberry tree has declined and more consumers are choosing the Japanese blueberry shrub. Gardening Central suggests planting the Japanese blueberry tree as a hedge. 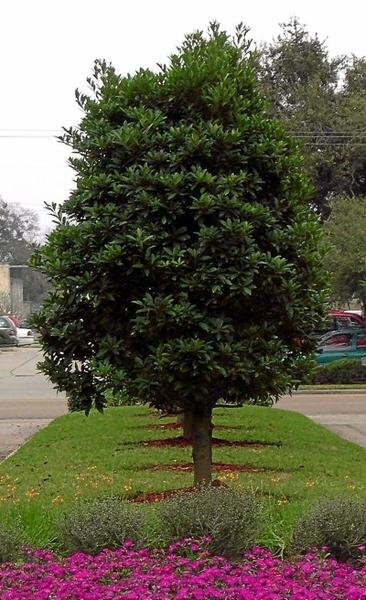 W.R. Hemsley, who has researched and written about it for Texas landscapes, agrees that the best potential landscape use for this tree is as a large hedge for shielding views or as an evergreen backdrop for contrasting flowers or shrubs. The tree and the shrub are the same plant, but they are used differently in the landscape. No matter the shape or how they are used, the Japanese blueberry tree is an attractive, fast-growing tree that grows well in the Victoria area. An added bonus is that it attracts birds and butterflies. And as an evergreen it is a beautiful addition to most landscapes. Once you recognize the Japanese blueberry tree, you will see them throughout Victoria. In my neighborhood I counted seven of them. If you are thinking about adding a new tree to your landscape, you might consider the Japanese blueberry tree and plant it this coming fall. Next spring, you'll be glad you did. • "Japanese Blueberry Tree" by W.R. Hemsley (included in Michael A. Arnold's Landscape Plants for Texas and Environs, 2005, third edition.